Data Driven Framework is a framework which is driven by the different combinations of input and output data. One way of passing different combinations of data is by Parameterization. In this method, we use different features of QTP. However in DDF, scripts are written to do parameterization. This kind of framework is useful when the AUT’s functionality must be tested with several inputs and capture the respective outputs. These inputs can be read from an external file such as Database, Excel, Outlook, Text file etc and the respective outputs are written back to the corresponding external source. In this tutorial, we will develop a data driven framework for a sample test case by using Excel as an external source for the Test data. The External source for this sample is an Excel file. The VB script in QTP must be written to open an Excel file in order to read the test data. This can be achieved in a hierarchical manner. 3. The sheet where the test data are present. 4. Finally the cell must be read. The “Name” field which is a WinEdit box. This field will be populated with a name once the OK button is clicked for a particular Order number. Before running the script, ensure that the excel file containing the test data has been saved and is closed. Below script is to read the order number from the excel and assign it into the application through variable “vOrder” and write the customer name from the application through variable “vName”. The Data Driven Framework can also be developed by writing descriptive programming. VBScript to open a record set or a table. The particular cell is read from the field. P.S: Microsoft Access 2010 cannot be connected using the below script. 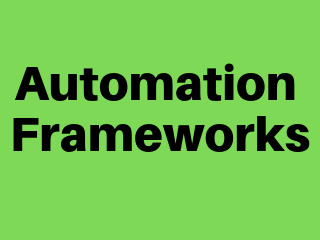 Keyword Driven Framework is a framework where keywords drive the test. Here keyword refers to the user defined functions. In this framework, keywords are created in order to perform a particular test step or a test case. These keywords are then called into the driver test to run several test cases in the same test. In general, the frameworks can be developed in three ways in order to run to the test. In this tutorial, The KDF is developed by recording and running the test. Our aim is to run a single test for five different test cases such as login into the application, insert an order, open an order, delete an order and close the application. Hence, we will record the test steps for these test cases and create the functions with keywords Login, InsertOrder, OpenOrder, DeleteOrder and CloseApp respectively. The functions that are created for different test cases are saved in a function library and are associated with the main test. It is enough to call the keywords for the needed test cases in the main test thereby reducing the size of the driver script in the main test. By running the above script, the actual result for all the five test cases can be obtained from a single test. Recording the steps is not always used when designing KDF for many applications on a same test. Hybrid framework is a combination of Data Driven Framework (DDF) and Keyword Driven Framework (KDF) where several test cases with several inputs can be executed in the same test. Description: Here the same script used to develop a DDF is used, thereby achieving the test case for several iterations. By following this simple method, parameterization of TC3 is achieved. If applicable, all the other test cases can also be parameterized in the same test. Above example, is a very simple way of designing hybrid framework. The same framework can also be achieved with descriptive programming. This can be used when we need all the test cases and inputs that are associated with particular test case, in the same test suite. Clear knowledge on the combining different framework is required.